I think it’s safe to say that the Ohio State Buckeyes were happy that Auburn improbably beat Alabama by returning a missed field goal 109 yards for a touchdown as time ran out. OSU linebacker filmed the reaction and posted it to his Twitter feed. It reminds you that the players are really just kids playing a game. 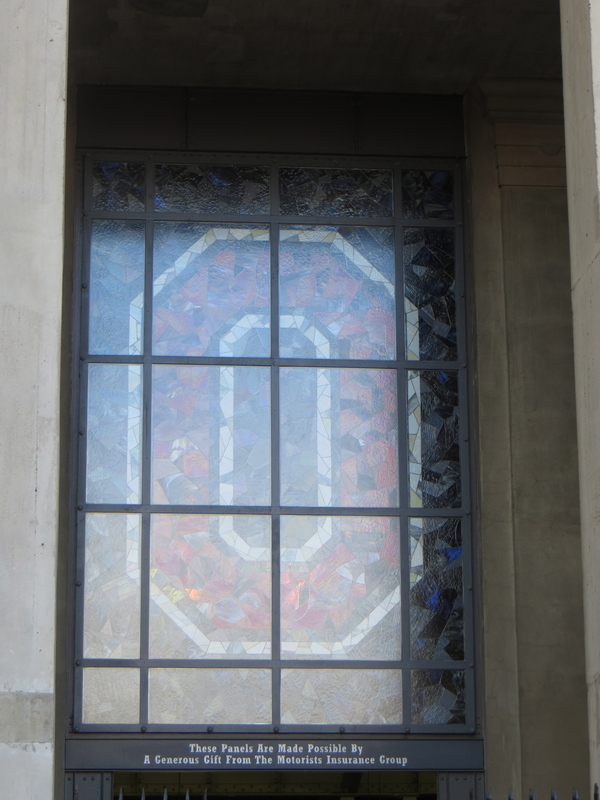 What a day for college football and the Buckeye Nation! In a rivalry filled with memorable games, this year’s version of The Game has to be one of the greatest ever. Back and forth, with the game ending on a thwarted effort by Michigan to get a two-point conversion and spring a stunning upset. But Ohio State’s defense, which had been gashed repeatedly during the day, finally made a play, Tyvis Powell knocked down the pass, and the Buckeyes hung on to win. This was the kind of game that makes the Ohio State-Michigan rivalry the greatest rivalry in college sports. Michigan ran just about every play in their playbook, their much-maligned offensive line held up, and Michigan quarterback Devin Gardner was a warrior who played a virtually flawless game. He never quit, and neither did the Wolverine coaching staff. 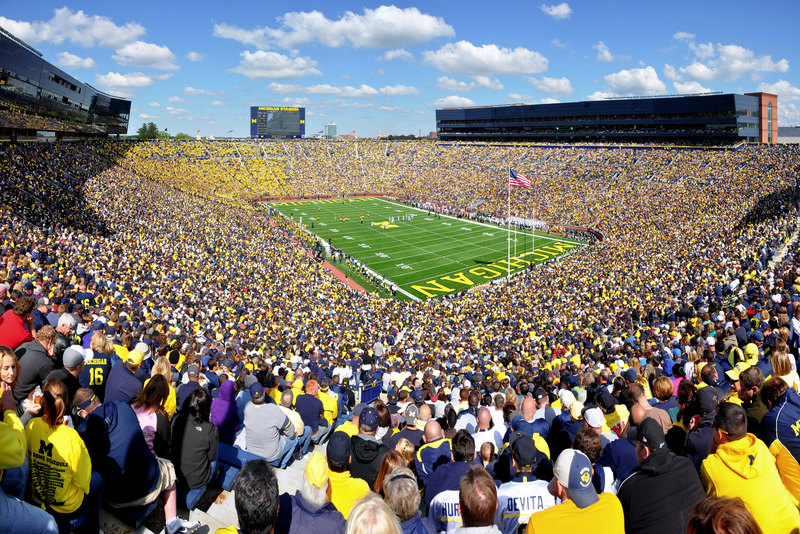 Michigan just kept coming, and coming, and coming. They gained more than 600 yards — 600 yards! — and were clicking on all cylinders. I give great credit to the Michigan team, from the head coach on down, for developing a near-perfect game plan and showing what this rivalry is all about. Fortunately for me and other Pepto-Bismol-guzzling members of Buckeye Nation, the Wolverines had no answer for the Ohio State offense. For the Buckeyes, the accolades must start with the offensive line. The Buckeyes front wall pushed the Michigan defensive line around like a precision lawnmowing team, and Carlos Hyde and Braxton Miller took full advantage. The Buckeyes ran for 393 yards — 393 yards! — and Carlos Hyde rumbled for the most yards ever by an OSU running back against the Wolverines. I was especially glad to see Carlos Hyde, who has been a monster, bounce back from his fumble to score the winning touchdown. So, the Buckeyes’ winning streak continues. The pundits can talk all they want about style points, and we can worry about that porous defense next week. For tonight, Columbus and Ohio and Buckeye lovers everywhere will breathe a sigh of relief and crack open a cold one. The Buckeyes won against their great rival, stay in the hunt for a BCS title game spot, and move on to the Big Ten championship game next weekend. That’s good enough for me. Recently, when we’ve taken our morning walks around the Yantis Loop, Penny, Kasey, and I have often found unwelcome surprises at various places along the fence line. They are bags of dog poop, carefully tied off yet left on the top of the fence posts. I pick them up, carry them to the next disposal container, and toss them in. And I always wonder: who in the heck would do such a thing? 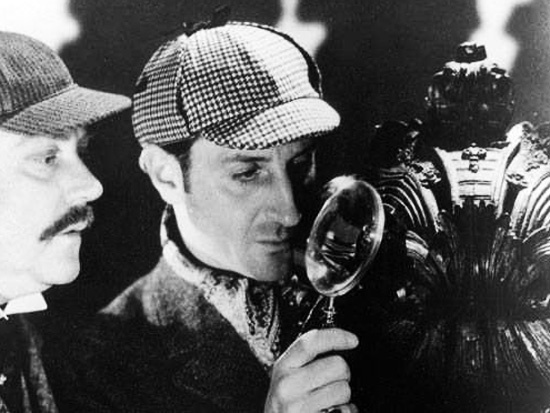 In The Sign of the Four, Sherlock Holmes explained, “when you have eliminated the impossible, whatever remains, however improbable, must be the truth.” What can we deduce from the poop bags? First, we know the culprit has a dog and is sufficiently mobile to make it to various places along the Yantis Loop track; cat lovers, the physically infirm, and agoraphobes therefore need not apply. Second, we know that the perpetrator has to be tall enough to reach the top of the three-foot-high fence posts and have the eye-hand coordination to tie off a bag of poop, which eliminates infants, toddlers, and the pooping dogs themselves. Third, the miscreant can’t be a total jerk; if they were a complete reprobate they wouldn’t bag the poop in the first place. Ergo, they must have some sense of social obligation. Finally, the poop bags are small, suggesting that the dog is a tiny, yapper dog, the kind that most men despise. From these clues, I deduce that the wrongdoer is a repressed husband who walks his wife’s appalling pocketbook pooch at her request, bags the poop while growing increasingly annoyed at the shrill barks, and then leaves the bagged poop on the fence as a last rebellious gesture before heading home to endure the tattered remains of his miserable, pathetic life. It’s either that, or a wealthy but absent-minded New Albany philanthropist who leaves the bags to identify citizens who care enough about their community to dispose of bags of a strange dog’s poop, but then forgets to reward those decent, responsible, civic-minded folks. It’s rare for the ground to be snow-covered in central Ohio over Thanksgiving; typically the temperature is in the 40s or low 50s, well-suited to a turkey bowl pickup football game or a turkey trot 5K. This year, however, the snow came early and the temperatures are cold. 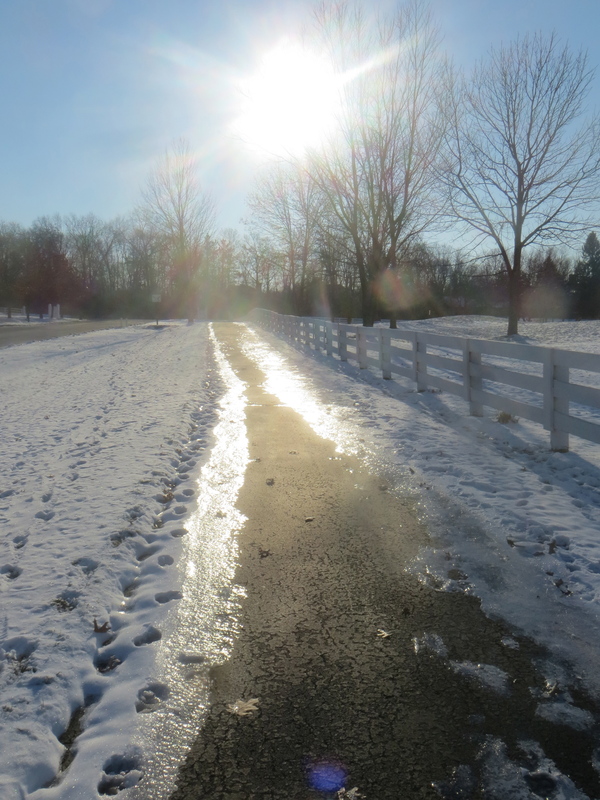 Our icy walking path is treacherous but shimmering in the bright morning sunshine. Should all couples hold hands? Kish’s sister Heidi believes that holding hands is crucial to a lasting romantic relationship. Kish and I respectfully disagree. We think it’s nice to see young couples with fingers intertwined and seniors doddering along with hands linked, but don’t expect us to do it. My disaffinity for holding hands stems from biology and experience. The unfortunate reality is that my hands sweat in any hand-holding scenario. When I was in high school and tried to hold hands with a girl, I felt my hands getting damp, which made me self-conscious, which made my hands sweat all the more. When I noticed my kind-hearted date trying to surreptitiously wipe off her oily palms on napkins, coat sleeves, curtains, and at every other opportunity, I realized that holding hands probably wasn’t going to increase my chances at meaningful romance. The experience came from a high school first date that involved a long drive to an event. My date grabbed my hand as we left and I drove left-handed, becoming increasingly uncomfortable because my right hand was locked into position. Once you’ve started holding hands, you can’t really retreat without making it seem like a kind of rebuke. So we drove along, chatting superficially, while I directed every ounce of self-awareness at my immobilized right hand. What you are supposed to do in such a long-term hand-holding scenario? Tickle the girl’s palm? Do “this is the church, this is the steeple” to keep your wrist muscles from spasming? So, I’ve long ago sworn off hand-holding, and fortunately the love of my life isn’t a hand-holder, either. Sometimes she’ll hold my arm as we walk along, and that suits us just fine. Many stores are open this Thanksgiving. You may hear some people feeling sorry for the people manning the cash registers, swabbing the spill on aisle 9, or otherwise working today. I can’t speak for everyone, but I worked part of one Thanksgiving Day, and it was great. It was in the early ’70s, when I was a teenage “bag boy” at the Big Bear grocery store at Kingsdale Shopping Center in Upper Arlington. The store was open from 8 to noon on Thanksgiving to allow people who had forgotten something to get what they needed for their meal. Most the cashiers and workers used their seniority to take the day off, so the more junior people on the Big Bear payroll — like me — had to work. But because the older women who typically manned the cash registers were off, I got to run one of the checkout lanes. And, most importantly for a cash-strapped 16-year-old, I got paid double-time wages for working on a holiday. The store was busy that Thanksgiving morning, but not overwhelmingly so. More importantly, every customer who stopped by for another package of stuffing or sticks of butter or a bag of potatoes was incredibly polite. They were genuinely grateful the Big Bear was open, and when I sincerely wished them a Happy Thanksgiving they responded in kind. I even got a few tips for bagging, which was unprecedented. After the shift was over I went home to my Thanksgiving meal, with a few extra dollars in my pocket and some holiday cheer in my heart. I didn’t mind working on Thanksgiving Day one bit.